Outdoors over indoors, adventure over routine. Life is an excellent place. Dragon Boy Noodle Bar is what I look for when it comes to bowls of udon noodles in soup. Coming out hot, the unwary eater gets a soft warning with the first sip of soup. Take a breath, appreciate the rich aroma steaming from your bowl, and take in the scene in this little World Square shop. To satisfy any udon urge in World Square. My choice is Kake Udon, a staple for anyone spending time in Japan on a budget. At $3.90 for a regular bowl, even in Sydney it's a competitive option for those with thin wallets. 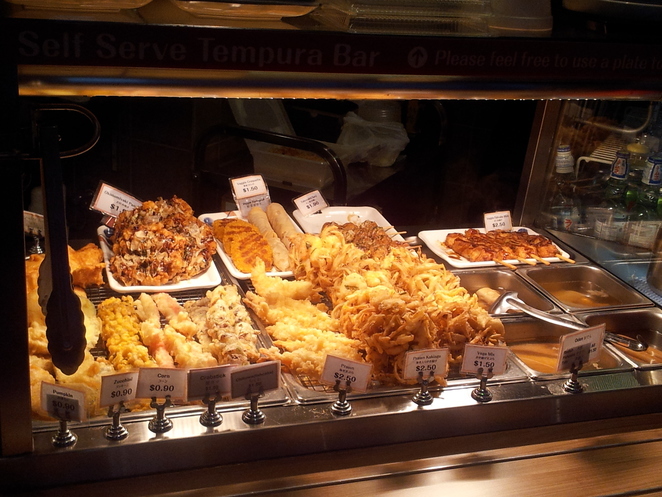 With spare change in my pocket and a long afternoon ahead I splash out at the extras area on tempura prawn ($2.50), takoyaki squid balls ($1.90), and a slice of tempura pumpkin at 90c. At the pay counter I fresh the soup up with a self-serve spoonful of chopped shallots and tempura flakes. The shop is a seating free for all, but coming just after 1pm. I'm on the back end of lunch rush hour and finding a spare table is no trouble. The self-service extras bar at Dragon Boy. Dragon Boy imports Sanuki Udon noodles from Kagawa prefecture in Japan, a place that many people (myself included) travel from far and wide to dine at one of its around 900 udon restaurants. No complaints from me. If the owner wants to import his udon from halfway across the planet, then serve it up at a few dollars a pop? It's nothing short of my social duty as a noodle fan to go try it out. Like its counterparts in Japan, Dragon Boy is order at the counter, pick your extras, move along and pay. It's fast and it's easy. I'm not there for the full-on fourteen course dining experience. 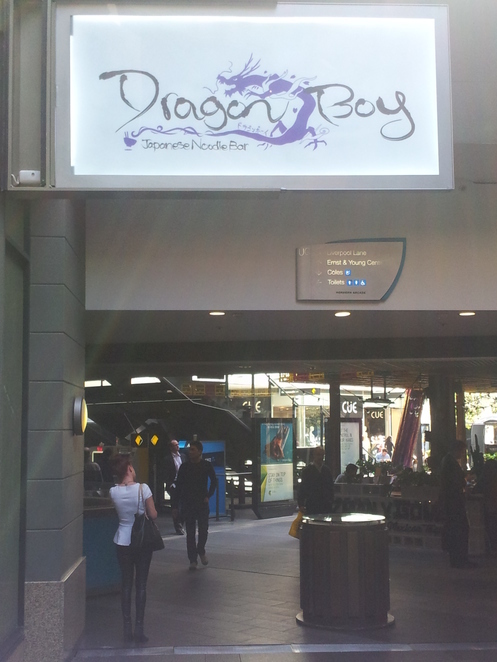 I only had a fiver in my wallet, coins in my jeans and a half hour to spare before work; more than enough at Dragon Boy. Service counter and kitchen at Dragon Boy. 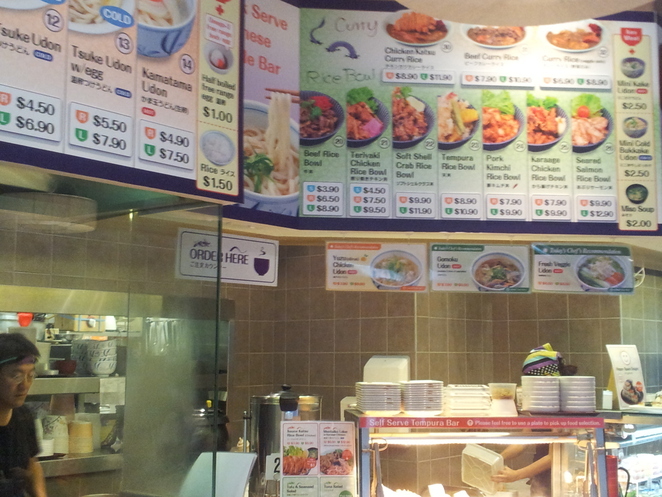 If udon is not your thing, a variety of rice bowls and curries are also on the menu. Look at spending from $5 for udon and some extras, and $10 or more if you like your meat. Sounds a bit like a Tapas counter, Japanese style. Small bits of everything that you can choose to make up your whole meal? I've been here and It's really good!